At Main Street Baseball, our teams know that no matter how tough we may think life is, there are always those whose challenges are far tougher than ours. That's why we don't just talk about giving back; it's why our clubs have some of the most generous charitable programs in all of Minor League Baseball. "With a set of fresh-painted baselines leading to home plate, Quad-Cities River Bandits groundskeeper Andrew Marking put the finishing touches on a refurbished youth baseball diamond Monday. Marking joined members of the River Bandits’ staff and volunteers from TBK Bank in completing work on a new Scott County Babe Ruth League field that is the start of an initiative to renovate youth baseball and softball fields in the Quad-Cities region." 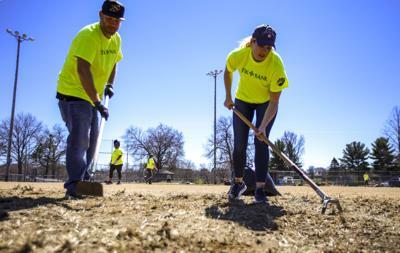 "As part of a youth field rejuvenation project, Quad Cities River Bandits vice president of sales Shawn Brown, left, and general manager Jacqueline Holm dig up crab grass in the infield at the Northwest Park Babe Ruth diamond in Davenport on Tuesday." "To show support for Transportation Security Administration officers facing their first payday without a check due to the government shutdown, the Quad Cities River Bandits bought the federal employees a meal on Friday. The 54 TSA officers at the Quad-City International Airport would typically receive their paychecks on Monday, said Jeffrey Hardacre, Assistant Federal Security Director for Downstate Illinois. But due to the three-week partial government shutdown, the employees have been told to continue working without pay." "River Bandits Owner Dave Heller said bringing his staff together to purchase food and grill burgers and hot dogs on Friday was one way to show support. "They're working so hard without pay to keep us safe and help us enjoy our freedom. And we just want to say 'thank you,'" Heller said. "We appreciate their hard work. They're caught in the middle of a terrible thing right now with the shutdown. And without taking political sides, we just want to let them know we appreciate what they're doing." The Quad-Cities club topped $600,000 in charitable donations in both 2017 and 2018, building on and adding to programs that Heller believes are at the core of what his organization is all about." "River Bandits owner Dave Heller presented a $100,000 check to Genesis Health System President and CEO Doug Cropper on Friday at the Genesis Birth Center, continuing the Midwest League baseball team’s support of youth and family health initiatives that has provided $350,000 in donations [to Genesis] over the past five years." "The Quad Cities River Bandits announced the three scholarship winners for the Bandit Scholars program during Saturday’s game at Modern Woodmen Park.... The one-of-a-kind Bandit Scholars program is the single largest college scholarship program in all of Minor League Baseball, encompassing more than 200 teams. The program was founded by Heller in 2009." "Every day is armed forces day for the River Bandits." "The Bandits as a franchise deserve a fair share of praise. It's a major donor to area charities and not-for-profits. It annually funds numerous college scholarships. And the charity is made possible only by the team's success." "The River Bandits' ongoing charitable efforts contributed more than $600,000 to Quad-City area organizations in 2017 and were recognized by Ballpark Digest as the 'best charitable works' in Minor League Baseball." "Since the Ferris wheel opened, the River Bandits have donated $250,000 following the past four seasons to the Genesis Foundation. Heller said the program will continue into the 2018 season and beyond." "Heller presented the largest check a Midwest League club has ever given to a charitable cause on Wednesday, a $100,000 donation to the Genesis Health Services Foundation to help fund several health initiatives for children in the Quad-City area. The gift benefits the Flu-Free Quad-Cities program, Camp Genesis for youths in families dealing with cancer, the Genesis Family Connects program and Genesis neonatal intensive care services." "Quad-Cities River Bandits owners Dave Heller and Roby Smith joined Black Hawk College president Bettie Truitt in announcing Tuesday the addition of Black Hawk to a program which already funds annual scholarships for students attending Augustana, St. Ambrose and the Eastern Iowa Community College campuses." "The Bandit Scholars Program was originally established in 2009. Prior to the addition of Black Hawk College, the program awarded scholarships to students from three colleges in the Quad Cities. Starting in 2018, Black Hawk College will become the fourth college to be added to that mix. As part of this arrangement, a Black Hawk College student will be awarded a scholarship to cover one year of tuition and receive an internship with the River Bandits." "It is rare for Ballpark Digest to present a national award twice in three years to the same minor-league baseball franchise. In this case, the publisher of the industry’s leading website views the way the Quad Cities River Bandits organization connects with the community through its charitable programs as a rarity. 'This club is unique in both the size of their charity programs and what they deliver,' Kevin Reichard said Wednesday after presenting River Bandits owners Dave Heller and Roby Smith with two national awards. 'The River Bandits are giving their charities what they need most — cash — and they are doing so in a sustainable fashion. That’s very commendable, and it separates them from their peers.'" "Proceeds from the new Genesis Kidz Koaster and a portion of every ticket sold for the Ferris wheel at Modern Woodmen Park have raised $100,000 in 2017 for the Genesis Foundation, helping fund Flu-Free Quad-Cities, neo-natal care and Camp Genesis programs. All proceeds from rides on the double-decker carousel and other nearby attractions opened this year raised $53,000 that ... will be donated to programs serving needy youths in the Quad-Cities." "In 2017, the Quad Cities River Bandits charitable contributions reached a franchise record of nearly $600,000. 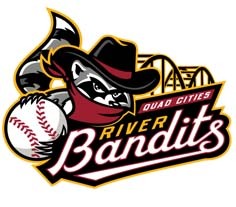 Between their scholarship program, believed to be the largest in the minor leagues, valued at nearly $80,000 annually, a $100,000 donation to Genesis Health Systems, and more than $400,000 in cash and merchandise donations to various organizations and causes throughout the Quad Cities, the River Bandits set records in giving this season. In addition to financial donations, the Bandits staff also donated over 1,250 hours of their time in volunteer work." "Whether it’s hurricane relief, supporting charities in the Quad Cities community or awarding college scholarships to Quad Cities students, the River Bandits are every bit the champions as their parent club. For their continued excellence for community work, the River Bandits are Ballpark Digest’s choice for Best Charity Program in 2017. This is the second time the team has captured the award, as it previously claimed the prize in 2015." "Heller has poured substantial cash into charity and college scholarships." "Much like the desire of the Flu-Free Quad-Cities program it helps support, cutting a $50,000 check to support the Genesis Foundation has become an annual ritual for Quad-Cities River Bandits owner Dave Heller. For the third straight year, the River Bandits presented the Genesis Foundation with a check to benefit the Genesis Flu-Free Quad-Cities program, the Genesis Neonatal Intensive Care Unit and the Camp Genesis program which assists the families of cancer patients. The donation includes a contribution from the River Bandits as well as a portion of the proceeds from every ticket sold throughout the year to amusement rides at Modern Woodmen Park." "The giant-sized checks Quad-Cities River Bandits owner Dave Heller handed out Sunday represent the size of the contributions made in athletics, the classroom and community by recipients of this year’s Bandit scholarships. Carly Donahue of Pleasant Valley, Ryan Lorber of Davenport Central and Dylan Sortillo of Bettendorf were each presented with one-year full-tuition scholarships and will receive an internship in 2017 with the Midwest League team as winners of this year’s awards." "With proceeds benefiting area charities, the River Bandits have contributed tens of thousands of dollars annually to projects such as Flu-Free Quad-Cities which funds flu shots for area youths. The club's Bandit Scholars program has also provided multiple one-year full-tuition scholarships and provided internship opportunities for nearly a decade." "The Spinners Scholars program, made possible by team owner Dave Heller and the Lowell Spinners ... was established to benefit students from the Merrimack Valley who exhibit a high level of integrity, academic excellence, an interest in sports, a demonstrated desire to improve their community, and a willingness to commit to making one’s future in the Merrimack Valley. The recipient will also participate in a paid summer internship with the Spinners organization." "Making a difference in the community is a goal for many professional baseball teams. Very few have attained the success displayed by the owners of the Quad Cities River Bandits in giving back to the community... and the River Bandits put that into practice every day of the year." "The River Bandits donate almost $80,000 a year to colleges and universities in our area, including Augustana College, St. Ambrose University, and Eastern Iowa Community Colleges." "Thumbs up to Quad-Cities River Bandits for promoting higher education. Bandits ownership this week handed out a pair of one-year full-rides to Augustana College and St. Ambrose University. A deal with Eastern Iowa Community College will add a third student to the annual award moving forward." Our team members stress to students the importance of reading, and urge that they continue reading each day throughout the summer. We reinforce that message by providing each of the nearly two thousand students with a book of their own to keep and read. Our Bandit Scholars Program ensures each student’s full year of tuition will be covered at no expense to them or their families – a combined value of more than $85,000 annually for the four scholarships. The scholarship awards also include a summer internship for each recipient with the River Bandits following the academic year. In addition, the team made a cash donation of $50,000 to Genesis Health System Foundation to help fund their Neonatal Intensive Care Unit, the only such unit in the entire Quad Cities area, as well as fund free flu shots for children throughout the Quad Cities region. In fact, the Bandits have committed to donating $250,000 in cash over five years to the Genesis Foundation. 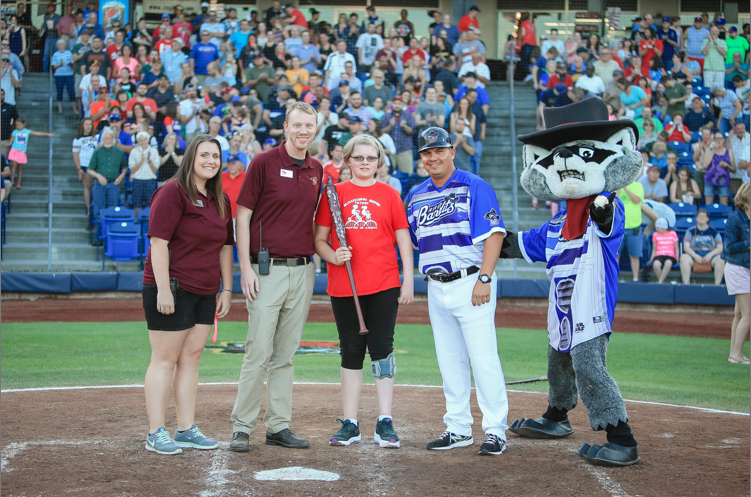 The River Bandits and Genesis Health System jointly recognize a Quad Cities resident with a “Home Run for Life”; each celebration features an individual who has overcome serious health obstacles. 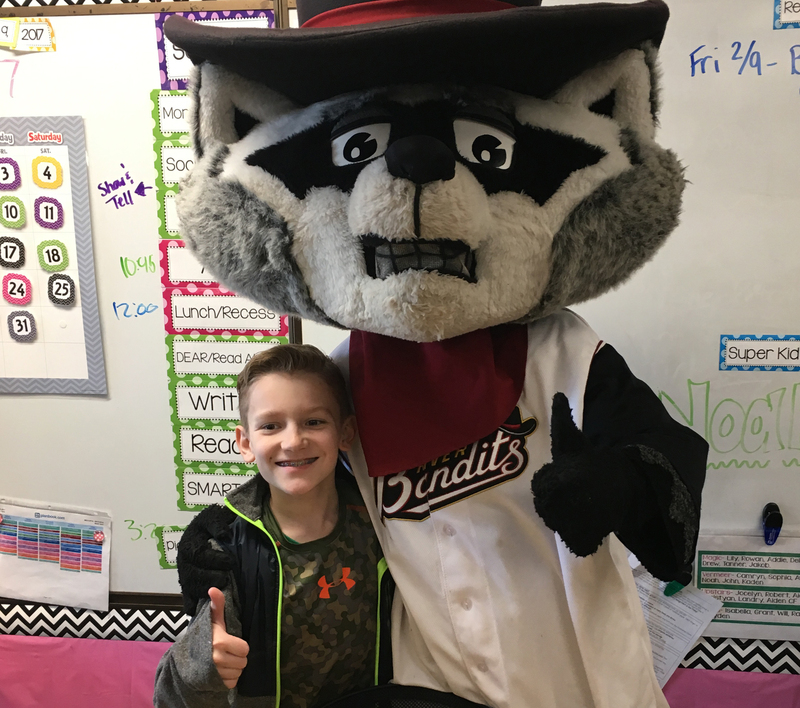 In February, Rascal can be spotted throughout the Quad Cities paw-delivering treats to some special Valentines at schools and local businesses. The team also hosted and supported numerous charitable events and organizations throughout its home community. In 2016 alone, the Bandits made more than 700 donations to hundreds of different organizations totaling over $320,000, and maintained a strong commitment to charitable giving, amounting to more than $1.5 million over the last seven seasons. No wonder Ballpark Digest in 2015 gave the River Bandits its Community Service award for the best charitable programs in all of Minor League Baseball. In Wilmington, the Blue Rocks have been equally involved in the community. Indeed, the team has won the Carolina League's prestigious Matt Minker Community Service Award an unprecedented three times in a row -- in 2014, 2015 and 2016, each year that Main Street has owned the club! One of the most important community programs for the Blue Rocks is the team's relationship with the Alfred I. duPont Hospital for Children.Players made frequent visits throughout the season and, in so doing, built genuine and long-lasting relationships with many children suffering from very unfortunate illnesses. One cannot even begin to measure the impact of the smiles that the players generated when they took the time to visit these patients in the hospital. What we did not expect was that often those kids would get better -- or at least well enough to visit the ballpark -- and, in so doing, completely inspire and invigorate the players by their presence and their smiles. Players volunteered for these appearances, not out of obligation, but because of the difference they made in a child's life. 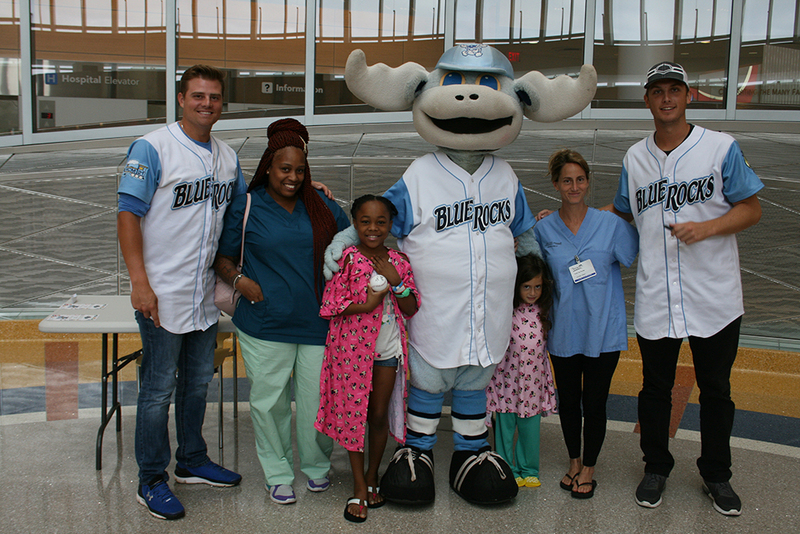 Blue Rocks players volunteer for appearances at numerous area hospitals, including the Alfred I. duPont Hospital for Children, not out of obligation, but because of the difference they make in a young person's life. 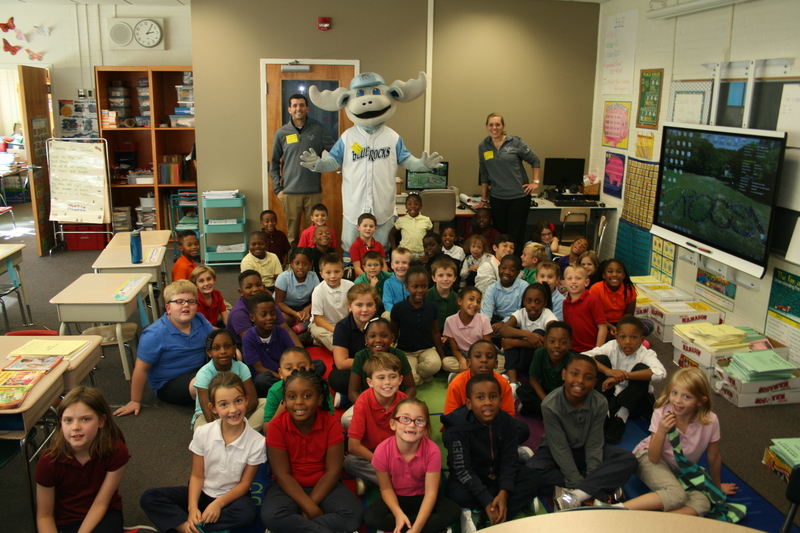 Blue Rocks players, staff and our popular Mascot Bluewinkle make one of numerous school visits throughout the state of Delaware. 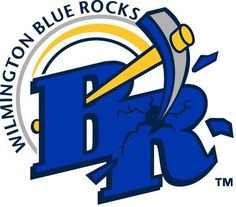 In 2016, the Blue Rocks also raised more than $33,000 for Habitat for Humanity; partnered with HealthSouth Rehabilitation Hospital in Middletown, DE, to help patients recovering from near-fatal accidents reacclimate themselves to society; and held multiple two-day urban community camps to educate inner-city youngsters in the game of baseball and encourage exercise. We had tremendous success with these camps and accomplished our goals in reaching kids, especially those who might not ever have the opportunity to play on a professional baseball field. In Lowell, the Spinners have donated more than $1 million to more than one thousand different organizations. 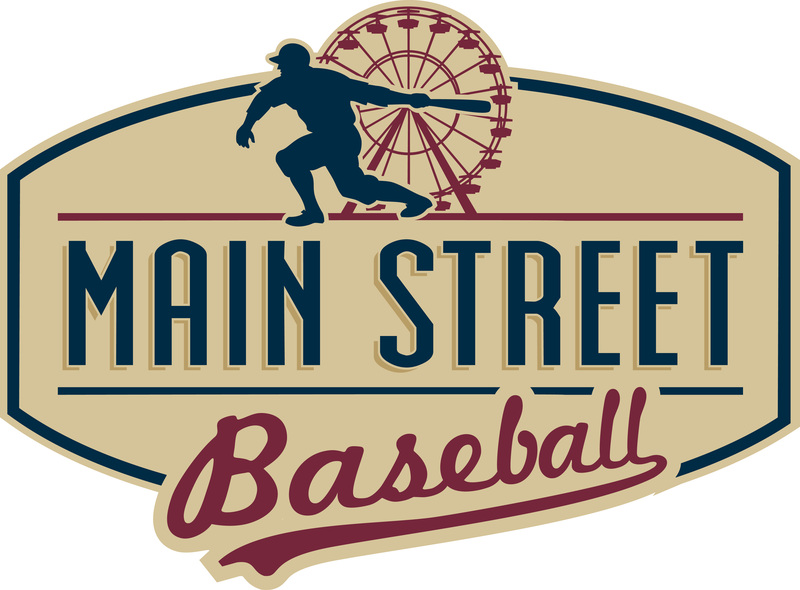 In 2016, in their first year as a member of Main Street Baseball, the Spinners increased their charitable giving; the team donated nearly $175,000 through various fundraising efforts such as jersey auctions, the 50/50 raffle, cash donations, gifts, and more. The Spinners' staff also increased the amount of time they donated to various community projects. 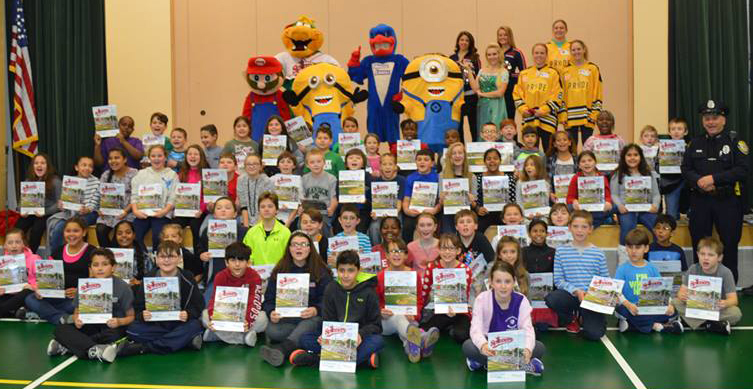 The staff and mascot, Canaligator, reached more than 13,000 students in 2016 through the team's reading program. This season, Main Street Baseball started a college scholarship foundation in honor of JoAnn Weber, one of the team's previous co-owners, who passed away in 2006 after a tragic bout with pancreatic cancer. The first scholarship will cover the entire year's tuition for a second-year student at Middlesex Community College in Lowell. The Spinners kicked off our 2015 "Spread the Love Tour" at Shamrock Elementary School in Woburn, MA. Students produced their own Christmas cards, which were then donated to veterans at the Bedford VA Hospital. Spinners players and young fans came together for our first "Campo de Beisbol" free clinic in 2016! In 2016-17, the Spinners continued their annual "Spread the Love Tour" in which hundreds of Christmas and Valentine's Day cards created by local students were donated to a local VA hospital. The front office also helped prepare over 500 bags of food the Merrimack Valley Food Bank's "Operation Nourish" campaign, designed to provide meals to students in low-income areas. In collaboration with the Merrimack Valley Food Bank, the Spinners and our fans were able to collect and donate literally a ton of peanut butter, which was then donated to the food bank and distributed to needy families throughout the area. In so doing the Spinners set the record for the largest peanut butter donation in history. Spinners' players love to get involved as well. In 2016, the Spinners hosted their first annual "Campo de Beisbol" in Lawrence, MA. 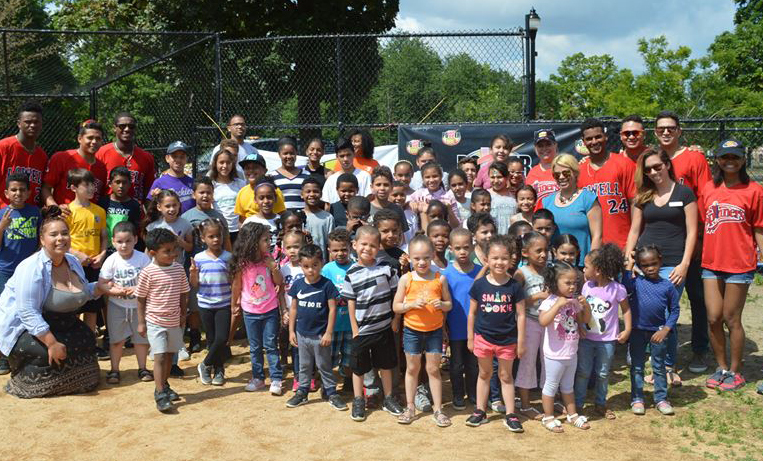 Several Spanish-speaking Spinners players hosted a free Spanish-language baseball clinic for the children of Lawrence. More than 100 area children attended the camp, and all were given tickets to that night's game. For many children, it was their first time experiencing a professional baseball game, and one that they will remember fondly for years to come. 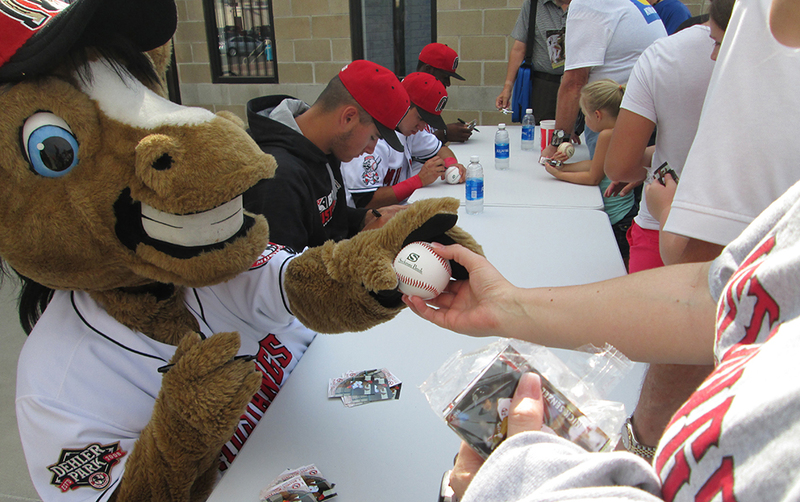 The Billings Mustangs have been deeply involved in youth and community programs since the club’s inaugural season way back in 1948. Our youth-oriented programs and activities, such as the Mustangs “Going to Bat for Literacy” reading program and baseball clinics, are specifically designed for getting children involved with baseball and the Mustangs. The team also supports community events and organizations throughout the Yellowstone Valley with cash and in-kind donations. Over the past two years, the Mustangs Care program has donated more than $50,000 to area groups and organizations, including the Boys and Girls Club of Yellowstone County, American Heart Association, Special Olympics of Montana, Big Brothers Big Sisters, American Cancer Society and many others. Our “Going to Bat for Literacy” campaign was started in 2011 and is a collaborative effort between the Mustangs and the United Way of Yellowstone County. Each spring, just before schools are dismissed for summer, the Mustangs staff, our mascot Homer, and volunteers from the United Way visit grades 1-3 in elementary schools throughout Billings and Laurel. 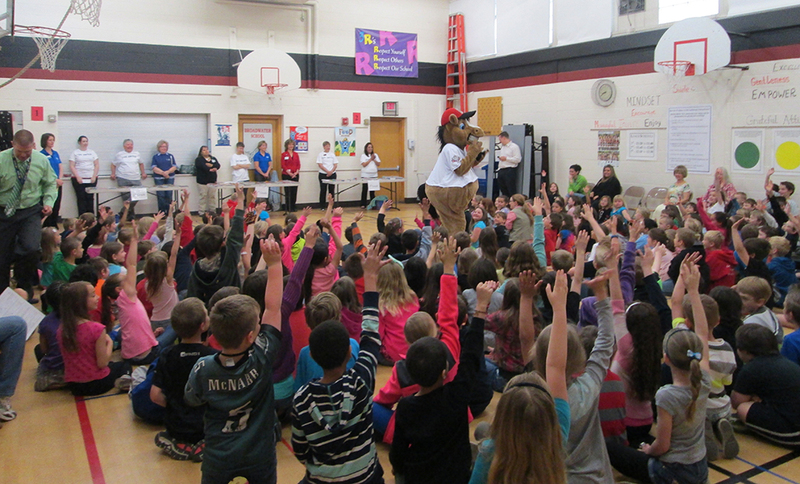 The team's mascot, Homer, visits one of the nine Title One elementary schools in Yellowstone County and is always warmly received by the kids. Player (and mascot) autographs are a fan-favorite in Billings. Another part of the “Going to Bat for Literacy” program is the Mustangs' involvement with the Billings Public Library and the Reading Rocks summer program. Each season the Mustangs contribute 500 tickets to the summer reading program at the Library for use as incentive and rewards for participants who meet their respective reading goals. Mustangs players visit both the Library and the Reading Rocks locations on several occasions during the course of the season to read with children, many of whom participate in both programs.